David Salter, our sponsor, finished 34th in just under 4 hours. (names with **C were in the Isle of Man Marathon Championship). Preview by John Watterson: here. Course: here. Grand Prix of Running: Unfortunately already CANCELLED this year. Alan Postlethwaite (IoM Northern AC) knocked 11mins19secs off the V60+ record to set a new mark of 1:26:49. He also still holds the V45-49 & the V55-59 records. Jean Snelling (York Knavesmire Harriers) set a new standard for the Ladies V70+ at 2:19:36. There was not a record in the age group previously. For the first time we had the new official Vets cateory of Men 35-39 this year. So we have the initial values set by Michael Garrett (Manx Harriers) at 1:25:52 in the Half Marathon, & 3:05:15 by Mark Clague (Manx Harriers) in the Marathon. Mark also won the Isle of Man Championship. Isle of Man Marathon and Half Marathon Sunday 13th August 2006. The top two in the marathon pictured about 10mins after the start (pic. Adrian Cowin). The winner was Ricard Verge Berrar (No.75) from Spain in 2hrs41mins57secs. Second place went to South African runner Stirling Slingerland (65) in 2:46:13. Murray Lambden from Manx Harriers finishing third overall in 2:56:38, but first in the Isle of Man Marathon Championship. Robbie Lambie, Western AC (IOM), 'winner' of the unofficial walk in the half marathon. More shots by Adrian Cowin: please click here. Shots by Ian Astin: please click here. 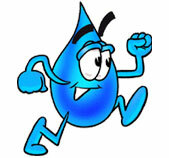 Please click on the following for the finishing lists -- Marathon or Half Marathon. 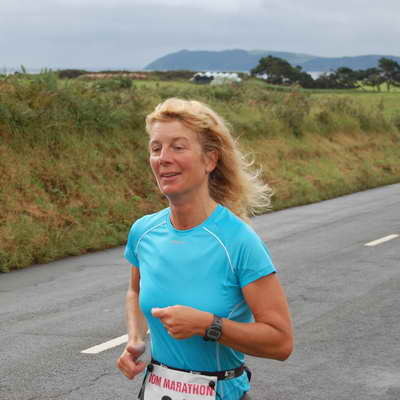 Isle of Man Marathon Championship Results. Men: 3rd David Young. 2nd Ben Scott (last year's winner). 1st Murray Lambden. Ladies: 3rd Bethany Clague. 2nd Shirley Foley (last year's winner). 1st Wendy Ross . Marathon Team Trophy was won by Manx Harriers team comprising Murray Lambden, Wendy Ross and Les Brown. An excellent effort by wheelchair athlete Gerry Forde from Blarney AC to finish in the top half of the marathon results with a time of 4:04:44. Follow the attached links for information on..... Sorry for old info. / dead links. New stuff coming soon!